Which players are best to snipe and trade with in FIFA FUT 18? Well, we selected a list of popular player cards who are easy to snipe and sell with profit on the transfer market. Check out the list below here and start sniping and trading with those players in Ultimate Team! Read the full list of search filters in FUT 18 below here and use them on the transfer market to snipe players. Easy coins and easy to use! Make a lot of coins with a low budget. Become an Ultimate Team trading legend! Search Filter 1: Quality: Gold. Position: RM. Nation: Argentina. Buy now price: 750 / 850. Keep refreshing the search and snipe the players (by changing/adjusting the max bid price). The players are easy to sell on for a minimum of 1100 coins. Search Filter 2: Quality: Gold. Position: RB. Nation: France. Buy now price: 600. Keep refreshing the search and snipe the players (by changing/adjusting the max bid price). The players are easy to sell on for a minimum of 750 coins. Search Filter 3: Quality: Gold. Position: RM. Nation: Brazil. Buy now price: 1200 / 1500. Keep refreshing the search and snipe the players (by changing/adjusting the max bid price). The players are easy to sell on for a minimum of 2000 coins. Search Filter 4: Quality: Gold. Nation: Spain. League: Hyundai A-League. Buy now price: 800 / 900. Keep refreshing the search and snipe the players (by changing/adjusting the max bid price). The players are easy to sell on for a minimum of 1200 coins. Search Filter 5: Quality: Gold. Nation: Spain. League: Super Lig. Buy now price: 1000. Keep refreshing the search and snipe the players (by changing/adjusting the max bid price). The players are easy to sell on for a minimum of 1800 coins. Search Filter 6: Quality: Silver. Position: RB League: Calcio A. Buy now price: 550 / 600. Keep refreshing the search and snipe the players (by changing/adjusting the max bid price). The players are easy to sell on for a minimum of 850 coins. Search Filter 7: Quality: Gold. Position: RM League: Liga NOS. Buy now price: 550 / 600. Keep refreshing the search and snipe the players (by changing/adjusting the max bid price). The players are easy to sell on for a minimum of 950 coins. First search for the lowest price the players sell for. After select the buy now price a few hundred / thousand coins lower than the lowest selling price. Keep repeating your search and snipe the cheap ones who appear. 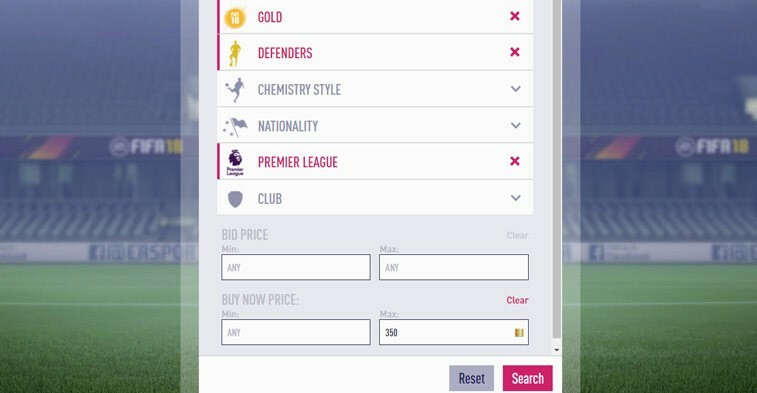 – Search on the transfer market for the player card you want to snipe. – Secondly check for the average buying price on the market. – You have found the average price of your player. – Go back to the Transfer Market starting page. – Select BUY NOW price a few hundred/thousand lower than the average price. – Keep repeating the search button and wait until a player pops up. – Keep changing the min price field, when no players pop up. This will make the search task refresh. Many SBC’s in FIFA 18 with good pack rewards require a minimum rating. Most of the times this minimum rating is 81 or 82 rated. When you search players for yourself or anticipate to buy players for upcoming Squad Building Challenges it’s good to snipe cheap 83 rated players. In many FIFA 18 SBC’s there is the requirement to use inform players. 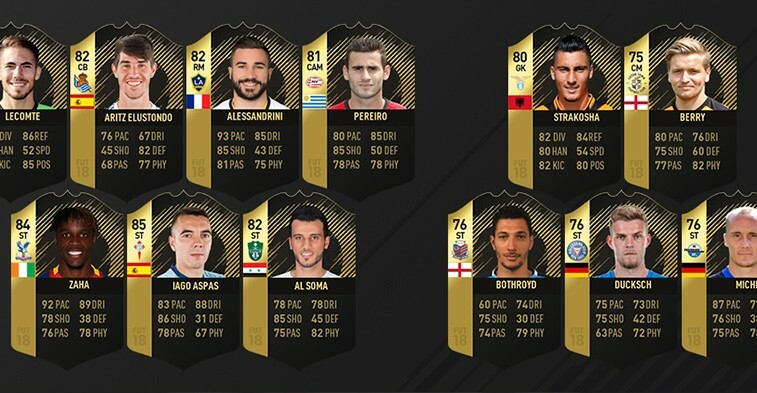 Mostly these inform cards requirements are Team of The Week (TOTW) players. Every new FIFA edition more and more special cards are dropped every week. This gives us a new opportunity to use this easy sniping method. For this method you’ll need to anticipate a little. Wait for the market to be steady and snipe cheap Team of the Week inform players from the bigger leagues. – Search for Team of the Week cards with a minimum of 80 rating. – Snipe the cheap players who are worth between 10.000 and 15.000. – Do some research which players can be sniped really easy. After you’ve bought some inform Team of the Week cards there are two options you can do. Firstly, if you made a really good deal sell the inform card immediately on the market. Secondly, save the inform cards in your club and wait for new SBC’s which require inform cards. SBC’s you need to watch are: ICON SBC, Player of the Month SBC, League SBC. When you have a small budget it’s a good reference point to start with sniping players from the English Premier League or the Spanish La Liga. It is also a good tactic to earn lots of coins and get your balance far above the 10.000 coins mark. After reaching the 10.000 mark, you will be able to start trading with more high rolers in Ultimate Team 18. Now, buy all the Premier League or La Liga Defenders that show up in the search pages. You don’t have to be very precise since the cards are not very rare, so when there are no player cards for sale just repeat the search again. 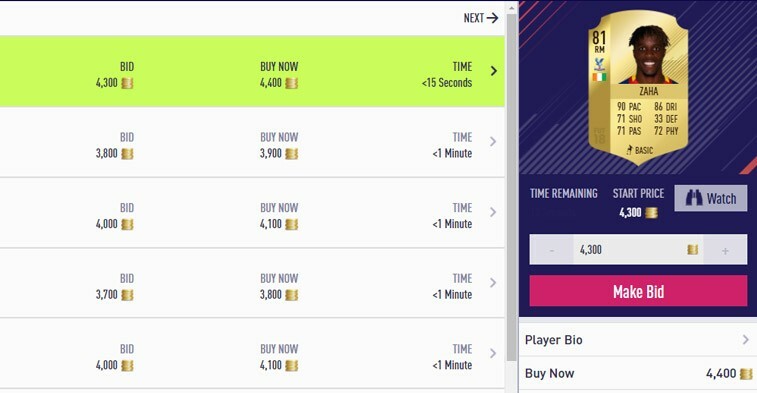 After requiring a list of player cards you bought really cheap from the market, you should list all players on the market for the start price between 100 and 150 coins higher than you purchased them. There are many FIFA players who do not have much patient and will snipe the player for a little more. So it’s really easy to sell the defenders you’ve just bought. A quick tip: Mind the 5% tax that comes with each transfer you put up. Calculate this into your buy now price! Prior to starting sniping players, you have to make sure you have built a proper budget. A good minimum coin balance is 5.000 to 10.000 coins. It is advisable to not buy packs with the coins you’ve earned. Unfortunately you have got to get really lucky to make a profit out of packs, so it’s better read this FUT 18 snipe players guide instead and find out cards are the best to snipe in FIFA FUT 18.